The Centre for Natural Pain Solutions is pleased to be able to provide Hyperthermia Treatment. We look forward to assisting clients in Winnipeg, Manitoba, Canada, as well as opening our appointment availability to willing travellers from the Canada and United States. We offer competitive options to those offered at Mexican oncology facilities. Hyperthermia Treatment is a common oncology treatment often recommended and performed in Europe, where German oncologists are trained in alternative therapies, and while this is not the case in North America, there are numerous studies showing the tremendous benefit to cancer patients. Hyperthermia treatment, also known as thermotherapy or thermal therapy, is an oncology treatment which uses carefully controlled heating of a tumor to fever temperatures and make it susceptible to destruction. This treatment is available in Winnipeg, Manitoba, Canada at the Centre for Natural Pain Solutions, for those seeking treatment locally and beyond, in the United States and Mexico. Over 100,000 hyperthermia treatments per year with the OncoTherm hyperthermia device are provided across the world. It is a Health Canada approved, not evasive integrated therapy. Which cancers show benefit from hyperthermia treatment? What are the types of Hyperthermia treatment? Loco-Regional Hyperthermia (LRHT) generates heat within a localized area of the body, such as a tumour. Using a lower frequency of 13.56 MHz, even deep tumours can be treated1. 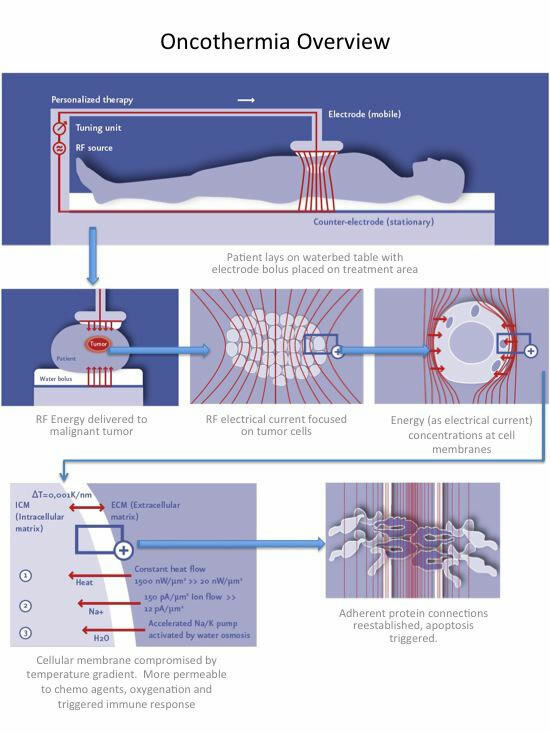 This type of hyperthermia treatment uses a goal temperature of 41-45 °C and lasts approximately 1 hr. Nonetheless, using a radiant infrared device, hyperthermia can be stimulated in the whole body of a patient (i.e. Whole Body Hyperthermia or WBHT). However, the target temperature is lower than LRHT and within the fever-range of 38.5-40.5 °C1. 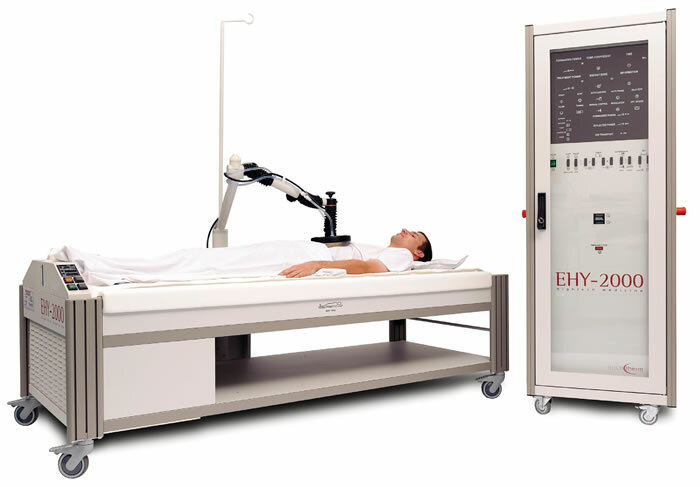 Loco-Regional Hyperthermia with Oncotherm EHY-2000 device. One of the world’s most advanced hyperthermia machines available at Centre for Natural Pain Solutions, Winnipeg, Canada. With LRHT, most of the body remains at the average core temperature with just the tumour increasing in temperature. In this way, our bodies act as a sink for the heat to funnel into from the tumour2. In heating the whole body, WBHT (Whole-body hyperthermia), on the other hand, drives heat into the tumour. Largely, the body attempts to reach a temperature balance (i.e. homeostasis) during both hyperthermia treatments through vasodilation, or an increase in the size of our blood vessels. What does Hyperthermia do to Cancer? Both treatments, LRHT and WBHT, increase blood flow, capillary filtration, capillary pressure and oxygen delivery2. However, an increase in temperature changes the structure and chemical bonds of molecules within cells. As such, an increase of heat also shifts cells into a state of high metabolic demand. Even with an increase of such demands in tumours, the surrounding intact tissue still transports the same quantity of nutrients2. With an unmet need for molecules such as glucose, the tumour is forced to use all of its energy stores. Subsequently, the cancer lesion starves and shrinks. As levels of energy molecules like ATP decrease, lactic acids build up and decreases pH in tumour cells under hyperthermia treatment2,3. Furthermore, DNA replication slows or potentially stops in cells under the stress of high temperatures2,4,5. A lack of ATP also induces an imbalance of ions within these tumour cells2,6. Increased blood flow brings immune cells, such as phagocytes, to tumour sites. Likewise, antigen-presenting cells (APCs) will display tumour antigens on their surface and on the surface of the tumor cells2,7. APCs will also secrete these antigens to circulate in extracellular fluid2,8. All these processes simultaneously initiate an immune response against the tumour2,3,9. Fever-like increases in temperature to an area with cancer will also break tumour cells down2,10. By damaging the cell membrane of tumours, damage-associated molecular patterns (DAMPS) are exposed. These DAMPS then trigger our immune system to recognize the presence of the cancer. Cells of our immune system, such as natural killer cells and dendritic cells, will recognize and attack these heat-damaged tumour cells10. Eventually, immune cells will stimulate a process called “apoptosis” or a controlled cell death of the tumour. During times of high body temperatures, the expression of specific heat shock proteins, also called chaperone proteins (ex: HSP70), is increased2. While some of these chaperone proteins do not suppress tumours, HSP70 specifically activates mediators for apoptosis as well as stimulates immune responses2,9. Interestingly, these proteins also turn on the p53 tumor suppressor pathway2,11. By decreasing the motility of tumour cells, hyperthermia treatment reduces the risk of tumour cells migrating to other areas of the body2,12. Likewise, a study in mice observed the “abscopal” or bystander effect in tumours under hyperthermia treatment2,13. That is to say, when one tumour in the body was treated with hyperthermia and immune therapy was administered systematically, tumours in other parts of the body also became suppressed2,14. Can Hyperthermia be combined with other forms of treatment? Yes! Hyperthermia can be combined with chemotherapy and/or radiotherapy, as well as naturopathic treatment modalities, to increase their effectiveness as well as reduce the potential for tumor resistance1,2. As previously mentioned, hyperthermia also stimulates apoptosis in tumour cells. In this way, the cancer cells become more susceptible to cancer treatments such as chemotherapy and radiotherapy. However, hyperthermia also stops cell division, which increases the capacity of cancer treatments to work on these tissues1,2. Hyperthermia-induced vasodilation increases the transport of drugs that are administered systemically. In particular, this increase in drug delivery increases the effectiveness of chemotherapy2,15,16. In fact, chemotherapy combined with hyperthermia reduces the overall effect of the drugs on the body because the drug targets itself into the tumour cells. Furthermore, lower doses of chemotherapy may be used in some cases when combined with hyperthermia2,17,18. In the same way, increased vasodilation also increases the effect of radiotherapies2. By increasing the concentration of oxygen in the tissues, tumours become more sensitive to ionizing radiation2,18. Increased heat in tumour cells also reduces the expression of DNA-dependent protein-kinase, which further sensitizes tumours to radiation2,20. Nonetheless, surgical treatments also benefit from hyperthermia2. By increasing temperature, blood vessel formation is reduced and heat becomes trapped inside the tumour. This heat treated tumour not only reduces in size but also becomes more prominent for surgical removal2,21. Hyperthermia can also be used during the surgery to improve the result of the treatment2,22,23. Even after surgical removal, hyperthermia has also been found to prevent relapse and metastasis of tumours2,24. Recent evidence has shown that Hyperthermia can be combined gene-therapy in specific cancers, such as advanced breast cancer2,25. In particular, the expression of genes during heat treatment are effective, such as promoters of heat shock proteins26. Can hyperthermia be used on it’s own? What kind of cancer patients can use Hyperthermia? Which cancers can be treated with Hyperthermia? 51 Fiorentini, G., Giovanis, P., Rossi, S., et al. (2006) A phase II clinical study on relapsed malignant gliomas treated with electro-hyperthermia. In Vivo 20:721-724. 59 Morita, M., Kuwano, H., Araki, K. et al. (2001) Prognostic significance of lymphocyte infiltration following preoperative chemoradiotherapy and hyperthermia for esophageal cancer. International Journal of Radiation Oncology 49(5):1259–1266. 60 Donato, V., Zurlo, A., Banelli E. et al. (1996) Local hyperthermia and radiation therapy in the treatment of superficially located lymphomas and recurrent Hodgkin’s disease. Oncol Rep. 3(6):1043-7.